To prepare the crust: Place the flour, salt, sugar and diced cold butter in a food processor. Process a few times, until the mixture looks like a coarse meal. Add the cold water and process again a few times. The dough should become more moist. Turn out of the food processor and gather into a ball. Lightly dust your countertop with flour, and knead the dough 3 to 4 times until it comes together. Shape into a flat ball, wrap in plastic wrap and refrigerate for until firm, about an hour. To prepare the filling: In a bowl, beat the eggs with a whisk until foamy. Incorporate the Coronado® Dulce de Leche Caramel Cinnamon, brown sugar, corn syrup, melted butter and salt and whisk until it is well blended. Add the chopped pecans and chocolate and mix well. To assemble the pie: Set an oven rack in the middle of the oven and preheat to 375 degrees Fahrenheit. Remove the dough from the refrigerator. Lightly dust your countertop, hands and a rolling pin with flour. Roll out the dough into about an 11” to 12” round. Place it in a pie mold, pressing the bottom and sides into the mold and crimp the edge on top. Pour the filling into pie crust. Cover the pie loosely with aluminum foil and place in the oven. Bake for 55 minutes, or until the pie is set and edges have lightly browned. Remove from the oven and let cool before serving. Where do I get the Dulce de Leche caramel cinnamon? I am only finding Coronado Cajeta? Is it the same? Oh you can use that too, Marsha (or any cajeta you find)…and then add cinnamon (to taste) to the cajeta. Did any one bother to read the recipe? The recipe calls for 1/2 Cup of Brown Sugar and 1/2 Cup of Corn Syrup. In the video, Patti says 1/4 (quarter cup). Soooooo…. I was following the recipe and put 1/2 C of Brown sugar and realized that it was different. I used 1/4 C of corn syrup. My pie is in the oven, I’m sure it will taste great but …..can you clarify which is correct? Thanks. Oh after filming an episode, I sometimes work on the recipe to make it even more yum. The written recipe is what you should follow. Enjoy the pie, Maria. I made this recipe today, absolutely fabulous!! Thanks Pati !! 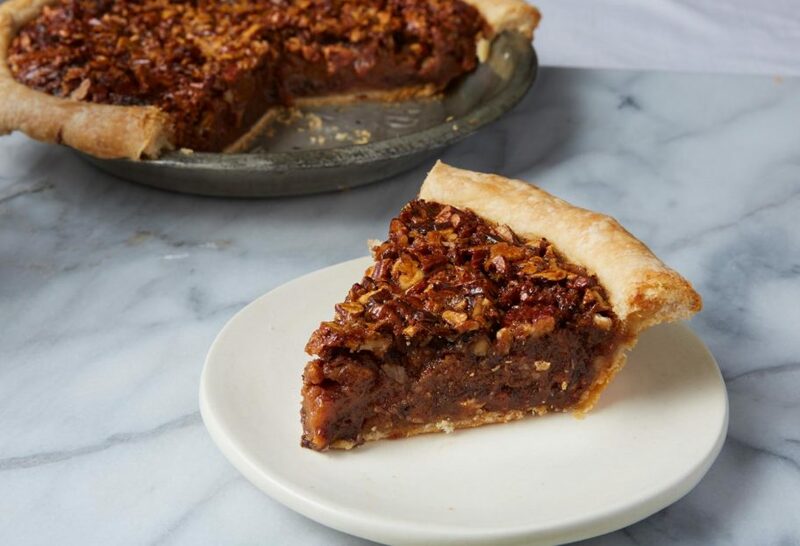 I always wanted a pecan pie with pecans from top to bottom. The flavors are so amazing. So glad my pecan pie was just what you were looking for, Teri! I just put it in the oven! Can’t wait to try it. Thank you! Say Hi to your kids for me too! A Bilingual home is a great home! I made this pie on Thanksgiving Day and there was not even a crumb left! I could not find Corronado Dolce de Leche caramel cinnamin in time (I did find it two days later at another store) so I looked for a recipe online. Goat’s milk is available here and the other ingredients are raw sugar, vanilla bean and cinamin. It takes about 2 hours to make but it’s worth it! I’m making it all the time now because it’s so easy! Thanks for another good recipe! Not even a crumb left….love it, Greg! I left out the cinnamon and used the plain dulce de Leche and bought a frozen pie crust (I was in a hurry!) and it came out so beautiful and delicious! ¡Muchisimo gracías! Super! I’m so happy you loved it, Marcia. Coronado® Dulce de Leche Caramel Cinnamon. I have 13.4 oz Nestle La Lechera Dulce Leche Milk Based Caramel. I guess I can add some Cinnamon, if so how much. Or is there another substitute I can make? Oh you can add cinnamon to taste to the dulce de leche that you have, Doug. Enjoy the pie! Very puzzled…. I wanted to try this recipe but gave up as I can not locate the Corronado Dolce de Leche caramel cinnamin. Now I see a the link to the product but still no progress as the web site does not mention or show the product so I called Barcel-USA and they confirmed this is not in their product line up. Hmmmm, if you can’t find the Dulce de Leche, you can add cinnamon to whichever brand that you can find. You can add it directly to the mixture. Have fun making the pie, Phil! I baked it & it’s waiting patiently in the fridge for tomorrow, IT LOOKS SO BEAUTIFUL ♥️. I’ll take a picture & share on Instagram and Facebook. Thank you Pati & HAPPY THANKSGIVING! Can’t wait to see it, Velia! Pati, this looks delicious! I’m having trouble finding where to buy Coronado® Dulce de Leche Caramel Cinnamon, though. Any recommendations? I can’t seem to find the exact one with cinnamon and caramel. Thanks in advance! Oh thank you Amber! I hope you love the pie. I recommend you find the Coronado Dulce de Leche Caramel Cinnamon. Here’s more information: https://barcel-usa.com/coronado But if you can’t find it, you can use any dulce de leche you have. Pati…. I stumbled across your TV program while baking this Sunday…Soooo Excited. Logged onto your web site and found this wonderful looking Dulce de Leche Caramel Cinnamon Chocolate Pecan Pie. Question, Can it be made a day ahead? How to store…counter top or place in fridge? Oh I’m glad you found me, Lorraine. You can make it ahead and keep it in the fridge. Then bring it to room temp on the counter before serving. Happy Thanksgiving!